The Bugatti Chiron, the world’s most powerful, fastest, most luxurious and most exclusive production super sports car, is coming to Monaco to celebrate the opening of the French luxury brand’s new dealership location at the heart of the principality. The vehicle showroom in the new brand design is taking up residence on the ground floor of the Fairmont Hotel, now supplemented by Bugatti’s first lifestyle boutique in Monaco. Following Bugatti Tokyo and Munich, Monte Carlo is the third location with a car showroom and lifestyle boutique under one roof. Bugatti’s sales partner on Côte d‘Azur is the Monaco Luxury Group, which has been an official Bugatti dealer since October 2013. Bugatti currently has 32 dealers in 17 countries. Bugatti’s Monte Carlo showroom and lifestyle boutique is located on the ground floor of the Fairmont Hotel at the heart of Monaco. The entry section has a show area that sets the scene for the star of any Bugatti showroom – the Bugatti Chiron. Blue, Bugatti’s brand colour, predominates in the modern presentation which is characterized by pronounced lines and clear surfaces, like Bugatti super sports cars. A horizontal communication strip running along the wall is used to display product information and images as well as highlights from the history of the brand. Customers can also configure their new Bugatti here. Everything can be controlled intuitively using an iPad or tablet after customers have taken their seats in the luxurious lounge. 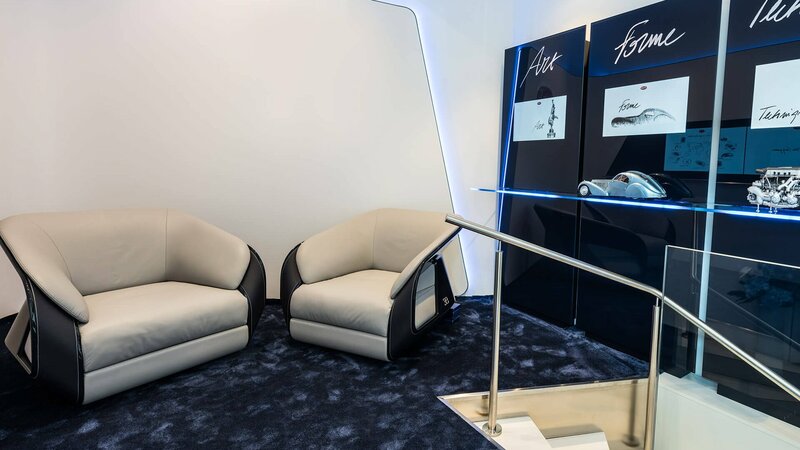 The lounge is equipped with furniture from the recently launched Bugatti Home Collection , which is showcased also in the brand’s new showrooms. The organically shaped armchairs are made from the finest leather and blue carbon fibre, high-grade materials requiring complex craftsmanship of the type which are also used in Bugatti super sports cars. The sides boast the EB logo. Next to the showroom, the world of the Ettore Bugatti Collection presents itself with elegance, the finest craftsmanship and exquisite design. The items in the collection, with a distinctive cut and refined details, are all individual creations crafted in Italy using the most exclusive materials available. In the boutique, you can also find precious items from Bugatti’s watch partner Parmigiani Fleurier as well as valuable writing utensils from Montegrappa and fine examples of glass art from Lalique. After Milan, London, Tokyo and Munich, Monaco is the fifth location in the world with a Bugatti brand lifestyle boutique or brand lifestyle showroom.